When the Cannon County Volunteer Fire Department started there was only one department in the county. That department is, the Mooretown Volunteer Fire Department, and is still in service today. At that time the only backup Mooretown had was the City of Woodbury Volunteer Fire Department and the City of Auburntown Volunteer Fire Department. In 1994 Cannon County received a grant for $300,000 to add six volunteer fire departments in the county and with that grant the county was able to purchase six fire trucks. The six departments were built in Midway, Bradyville, West Side, Gassaway, East Side, and Short Mountain. Each department’s fire chief was appointed by their communities’ Board of Directors. The Cannon County Commission gathered the fire chief’s together at Woodbury City Fire Department, there the County Commission had the six trucks and had each truck numbered one through six. The fire chief’s from each department drew numbers and whichever number that chief drew was the truck that department received. Midway received a 1971 model, Bradyville received a 1976 model, West Side received a 1976 model, Gassaway received a 1975 model, East Side received a 1976 model, and Short Mountain received a 1976 model. About three years ago Cannon County had to replace Mooretown’s 1974 Ford model fire truck due to wear and tear; it was replaced with a 1994 Freightliner. The Cannon County Commission approved the purchase of Mooretown’s truck on a three year note. That note has been paid off free and clear. In 2012 West Side brought the condition of their fire truck to the Cannon County Fire Board. After receiving information from a couple of different mechanics, the Cannon County Fire Board decided that truck needed to be replaced due to being unsafe for road use. West Side’s fire chief then went to the Cannon County Commission and the County Commission approved West Side to buy a newer truck. While West Side was looking for a newer truck, Gassaway brought their truck to the attention of the Cannon County Commission at which time they were approved to buy a newer truck after receiving information from a couple of mechanics. Shortly after East Side came before the Cannon County Fire Board to request for a newer truck. The bolts attaching the cab to the frame were rusted and made the truck unsafe for use. At this time the Cannon County Commission gave Cannon County Fire Chief Michael Underhill the authority to look for three newer fire trucks with a cap of $150,000. Chief Underhill searched the internet and checked with several different fire equipment distributers and found three 1990 model 1,000 gallon pumpers. 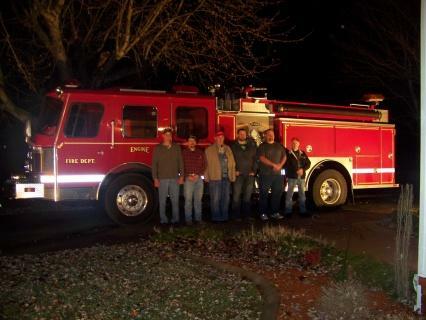 These trucks came from Burnett Fire Equipment in Friendship, Tennessee for a total of $147,000. This note is also on a three year term. The County Commission has done a great job at looking for ways to replace these trucks at no cost to the tax payers, they have came up with a way to make this happen without raising taxes. Each fire department has a county fire truck which is maintained with county funds. Some of you may have noticed that the departments have more than one truck. The departments with trucks other than the county truck were purchased with funds raised by the help and support from the great citizens in that department’s community. Fundraisers are a big part of how a volunteer fire department operates; funds raised help purchase life saving equipment and other needed items to help keep the communities safe. Those funds are also used to purchase and maintain other fire apparatus to help our communities. If you would like to know more about a fire department in your community or that is not in your community, feel free to contact your commissioner or fire chief. Each department is owned by the citizens of Cannon County. We will be glad to show you around, answer any questions you may have, and we can help you make safe plans for your family. If you are interested in becoming a volunteer firefighter contact your commissioner or fire chief. Volunteers are hard to come by these days and it is a great way to give back to your community and county. Volunteers have many different roles, so feel free to inquire about those roles. On behalf of each of Cannon County Fire Department we would like to thank everyone for their past and future support. Without you the citizens of Cannon County we would not be where we are today.